When most people visit Los Angeles, they’re looking for the glitz and glamour of Hollywood, the swanky shops on Rodeo Drive and the beaches of Venice or Santa Monica. But if you’re looking for a more laid-back vibe, you’ll want to visit Manhattan Beach. Manhattan Beach is home to many athletes and even a few celebrities, although there is a good chance you wouldn’t even recognize them as they tend to blend in with the carefree locals. The quintessential California beach town, it’s common to see people walking down the street barefoot with their surfboard in hand. One of the best parts of Manhattan Beach is that it’s only a 15-minute drive from LAX and you don’t have to get on one of the perpetually traffic-jammed freeways to get there. The following list is just a small sample of the many wonderful things you’ll find in Manhattan Beach. THE place for breakfast in Manhattan Beach. It’s a no frills diner with standard fare (omelettes, breakfast wraps and, of course, pancakes), but the highlight is if you’re lucky enough to snag a seat with an ocean view on the outdoor patio. Get there early, especially on the weekend, or you could easily be waiting over an hour to get a seat. A stone’s throw from the beach and the Manhattan Pier, Rock' N Fish is an excellent choice for seafood lovers, although there are options for those who don’t like seafood too. Be sure to try the popular Navy Grog rum cocktail. If you’re looking for a beer and a burger, this is the place to go. Open air, pub style atmosphere with excellent people watching if you can get a seat near the sidewalk. If you love mimosas, head to The Rockefeller for an above-average brunch and bottomless mimosas. A small restaurant with rustic décor, it’s also a good place for a casual lunch or dinner. With floor to ceiling windows, you’ll get spectacular views of the beach and the ocean, especially at sunset. You’ll pay more here than you would at most Manhattan Beach restaurants, but the oceanfront view is worth it. With home décor, bath and body products, jewelry, a cute kids section and men’s toiletries, there truly is something for everyone in this trendy gift shop. It’s also the perfect place to find stylish souvenirs! Eco-friendly clothing for men, women and children, and the store even has an indoor beach scene complete with sand. You’ll have a hard time finding a softer shirt than those at Marine Layer. Don’t be fooled by the name. Not only do they have a massive selection of high-end denim, you will also find trendy clothes for men and women as well as jewelry and accessories. In the back part of the store, behind the café, you’ll find a great selection of surf related gear and apparel. They also rent out surf, boogie and SUP boards. Only one block from the ocean, it’s the perfect place to go if you need something good to read while you’re relaxing on the beach. Cookies, cupcakes and donuts are just a few of the yummy treats you’ll find here. The surfboard cookies are a must-have. In addition to a vast selection of specialty treats and candy, the signature item here is the Cream’wich, an ice cream sandwich made with delicious artisan cookies. 'Nuff said. 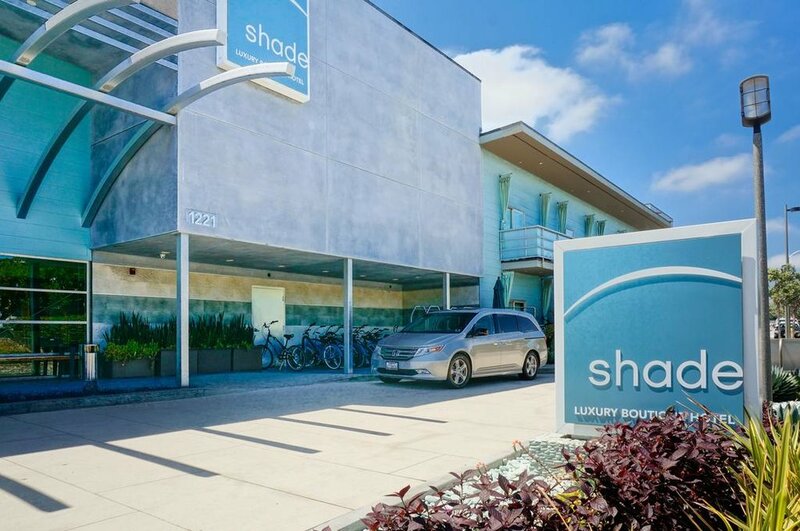 Trying to find accommodations in Manhattan Beach can be a bit of a challenge ever since city council banned short-term rentals (Airbnb, VRBO, etc.) in 2015, as have many other Los Angeles area cities. As a result, hotels book up fast so make reserving a room one of your first priorities if you’re planning a trip to this area. A luxury, boutique hotel located in the middle of town, only a few blocks from the beach. Enjoy the coastal cuisine and handcrafted cocktails in the Zinc@Shade restaurant or go for a dip in the rooftop pool and enjoy cocktails at the Skydeck. A recently renovated, boutique hotel with a retro vibe. Rooms even come with a record player and you can borrow records from the front desk. Other amenities include a courtyard with cabanas, an outdoor pool and the Second Story Restaurant. One of the more affordable options in the area, it’s about a 10 minute drive from the beach on the Manhattan Beach/Hermosa Beach border. It has a funky décor and a hip outdoor sundeck that features pool tables, bocce ball and a nice view of the ocean. 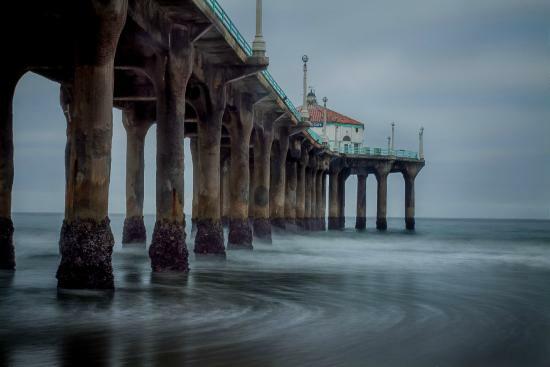 Take a stroll on the popular Manhattan Pier, located at the end of Manhattan Beach Boulevard. An excellent spot to watch surfers during the day and the sunset in the evening. Just be careful while you’re walking out to the pier that you don’t get run over by one of the many bicycle riders zipping by. The Strand is the name of the paved path that runs along the beach. With the Pacific on one side and multi-million dollar homes on the other side, you’ll never be at a loss for something to look at. The homes along The Strand are the reason Manhattan Beach has some of the most expensive real estate in the United States, per square foot. While you’re walking on The Strand, head south to where Manhattan Beach ends and Hermosa Beach begins to find the home that was used for the exterior shots of the beach house on the original Beverly Hills 90210. It’s currently on the market for $16.5 million. A trip to Manhattan Beach would not be complete without a trip to the actual beach. Parking and prime beach space can be hard to find so it’s best to head there early in the day to get a good spot.